This recipe is essentially the same as my mom’s dill pickle recipe but we thought we’d throw it in for good measure. Anyone growing a successful patch of cucumbers this year is likely to have a glut of them. What are you to do will all those cucumbers? We imagine lots will find their way into salads, sandwiches, and/or be eaten out of hand but we imagine you will still have plenty that don’t make it to the table. Why not put them up by making dill spears? 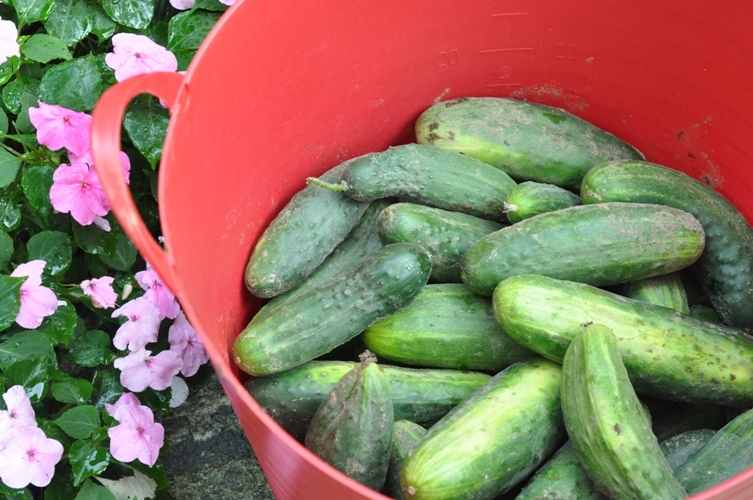 It is best to pick the cucumbers and put them up on the same day. This will ensure they remain as crisp as possible. These larger cucumbers are not iced. Rinse cucumbers well. 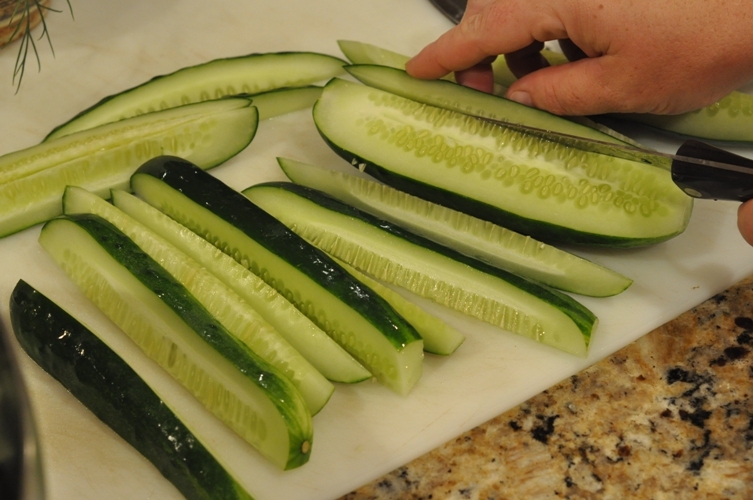 Remove blossom end and cut cucumbers into thin strips/wedges to fit the size of jar you are using. With mature cucumbers you may want to remove some of the larger seeds. Note: we use 1L wide mouth mason jars. In a large stainless steel saucepan combine water, vinegar, and salt. Bring to a boil. 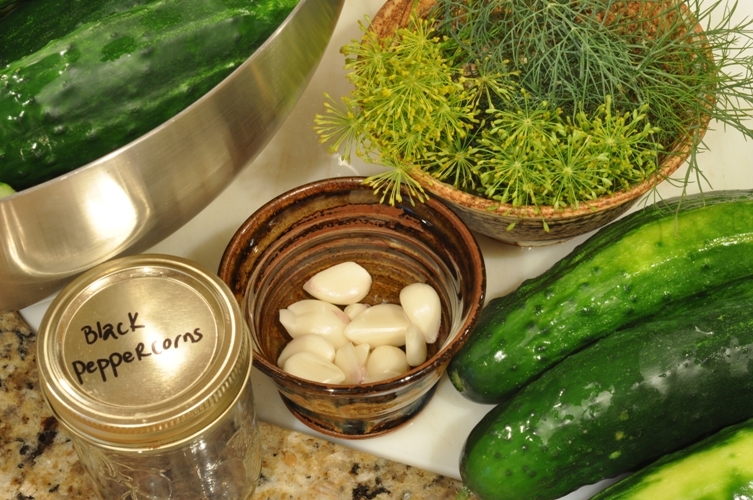 To each sterilized jar add black peppercorns, dill seed, fresh dill, and garlic. 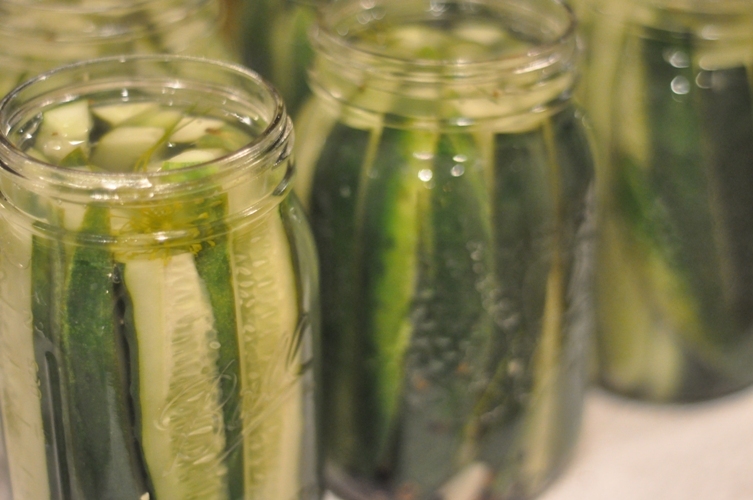 Pack cucumbers into each jar. Add boiling brine leaving 1/2″ headspace. Remove air bubbles, wipe rims, place lids and screw bands on adjusting so that they are just finger-tip tight. Process in a hot water bath for 10 minutes.